RICHLAND COUNTY, S.C. — A group of Spring Valley High School students walked out of class Friday morning, peacefully protesting the firing of school-resource officer Ben Fields. Fields, a Richland County Sheriff’s Department deputy, was fired Wednesday after video surfaced of him forcibly removing a Spring Valley student from a classroom Monday. “They said, ‘Bring back Fields.’ Everybody was saying that,” Spring Valley senior Ty’Juan Fulton, 18, said of the former deputy. Students sent photos and videos of their walkout in support of Fields to News19 through social media accounts. 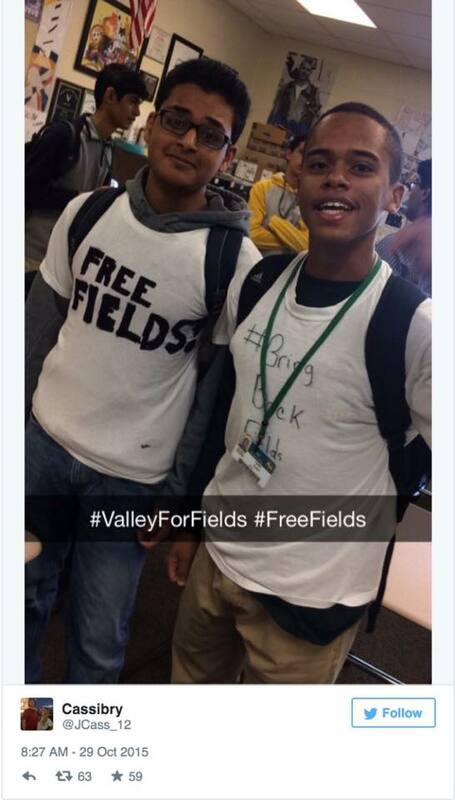 In those postings, some students could be seen wearing makeshift shirts with Fields’ name on it, and saying statements in support of the officer, including “Free Fields” and “Bring Back Fields.” Some students had originally said their intent was to walk out of the building, but the students did not leave the campus. Senior London Harrell was one of the supporters for Fields. She said she wanted her voice to be heard. “We just want to show that we’re still supporting him and everything and that he’s still a good guy, and everything and we don’t want his reputation to be ruined because of something that happened on Monday,” Harrell said. Fields also was a coach for the Spring Valley football team. A racially diverse group of students gathered in Spring Valley’s atrium about 10 a.m. Friday to express their opinions about Fields’ firing, which followed Sheriff Leon Lott’s condemnation of the deputy’s actions. The protest was “an orderly student-led activity,” Spring Valley principal Jeff Temoney said in an email. “Our students and our staff were safe. The protest lasted about 10 minutes. But it brought more national attention to the high school, as Richland 2 school district leaders await the outcome of a civil-rights investigation into Monday’s incident. Fields is white, and the student he removed from the class and arrested is African-American. An advocacy group for black parents said Friday it plans to continue to pressure the district to improve its policies dealing with how school-resource officers interact with students. Speaking in Tennessee, U.S. Secretary of Education Arne Duncan also mentioned the civil-rights investigation Friday. DeJuan Lino, 18, said Friday that he wanted to show his support for Fields, hopeful the fired deputy would be able to get another job soon. “He didn’t have to take it that far, but (the student) should have listened at the same time,” when she was asked to leave the classroom, he said. 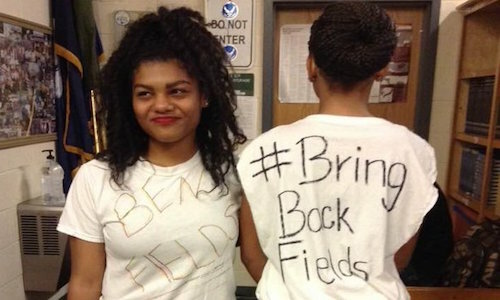 Several videos of the walkout surfaced on Twitter shortly after the protest, using hashtags of “#bringbackfields” and “#bringfieldsback,” which some students had written in marker on their shirts. After deadly blaze in Romania: A look at some of the world’s worst nightclub fires.